On July 17th Nikon will launch a new "D810 Switch & Save" promotion. 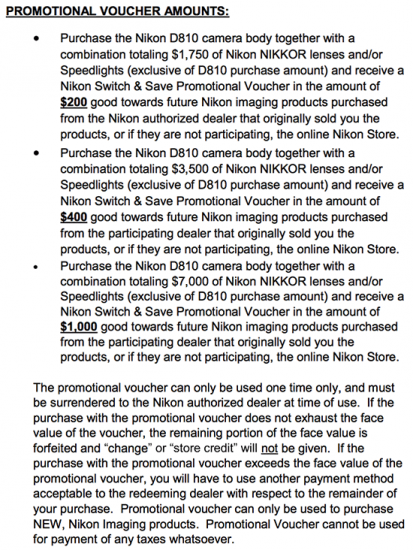 The PDF rebate form is already available online at B&H and Nikon's website. Since the D810 is scheduled to start shipping on July 17th, I believe all D810 purchases will be eligible for this promotion. Note that this is not an instant savings offer, you will have to fill up the form and mail it to Nikon in order to get your voucher. The Nikon D810 is currently available for pre-order at B&H | Amazon | Adorama | BestBuy.